In the case of Man on a Ledge the film’s title very accurately describes one half of the film. I am saying one half because the movie is a bizarre mash-up of other (better) movies. Asger Leth’s first feature film (he has previously directed the acclaimed documentary Ghost of Cité Soleil) is equal parts Phone Booth, The Negotiator and Inside Man. The movie opens with Nick Cassidy (Sam Worthington), checking into a fancy room in Roosevelt Hotel in New York City. After having a good meal, he calmly steps out of the window on a ledge, some 200 feet above street level and waits for police to arrive. Once there, he demands to talk to a specific negotiator, Lydia Mercer, played by Elizabeth Banks. Mercer’s reputation has recently been jaded by her most recent operation ending in a suicide afterall. Eventually she and her colleagues find out that Cassidy is, in fact, an ex-cop-turn-convict who has recently escaped from prison. His claim is that he has been set up by the real estate tycoon David Englander (Ed Harris) who blamed an apparent theft of his precious diamond on Cassidy. Now Cassidy has set a plan into motion to prove his innocence and expose Englander’s wrongdoings and him stepping out on a ledge is a crucial part of that plan. Can you follow it so far? So far this heavily sounds like Joel Schumacher’s far superior thriller Phone Booth which saw Colin Farrell trapped by a faceless sniper in the eponymous phone booth for the duration of the film with a little bit of The Negotiator (Samuel L. Jackson plays a professional police negotiator who is set up by his superiors) mixed into it. But as I have mentioned above, this is only one side of the film. Simultaneously to the described events a heist takes place across the street from the Roosevelt Hotel. Nick’s younger brother Joey (Jamie Bell) and his girlfriend (Genesis Rodriguez) orchestrate a break-in into Englander’s vault to find the diamond and thus prove Nick’s innocence. In the meanwhile Nick provides the necessary diversion. What sounds as a definitely workable premise never really finds a truly solid footing. The individual parts of the film work rather well, but they don’t really gel together. Sam Worthington does a fairly convincing job as he is finally not turning blue or fighting mythological monsters. 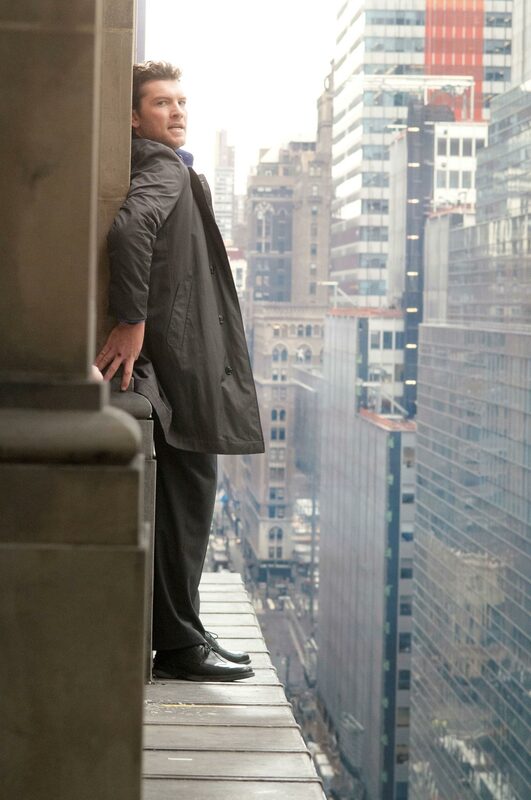 A lot here rests on his shoulders as about 90% of his role involves him sitting/standing/walking on the ledge. There is not much to play with here and he makes the best out of it. The usually lovable Elizabeth Banks makes the best she can out of her extremely clichéd role as the disgraced negotiator. The two work together well, even though Banks’ character starts to believe Nick Cassidy’s story way too fast. Fortunately the writers decided against trying to inject some romantic motions into this part of the plot. However, even though a good part of the film focuses on Worthington on the building’s ledge, there is barely ever a palpable sense of fear or danger here. Unlike in Phone Booth the constraints of the setting are just not used well enough, especially considering that it is the film’s main selling point (it’s the movie’s title!). There is never a real “will-he-or-won’t-he” kind of feel here which certainly diminishes the suspense, though it doesn’t entirely kill it. The parallel heist part of the film manages to build up more tension, however one can never get past the plot holes and the logic gaps of it. We’re just supposed to buy into the idea of two amateurs managing to learn (in theory, no less) how to break into a high-security vault within a year. It’s possible to let that slide, though as heist flicks have never been known for being particularly realistic or logical. It does deliver in the thrills department and that is what counts. Jamie Bell is a welcome presence, while Genesis Rodriguez serves purely as eye candy here. It’s Ed Harris’ smarmy villain who delivers the film’s best it of acting, but his screentime is unfortunately rather short. Absolutely lost in the shuffle is Kyra Sedgwick’s overzealous sensationalist TV reporter. If her character was to be cut out of the film, the viewer would never notice. 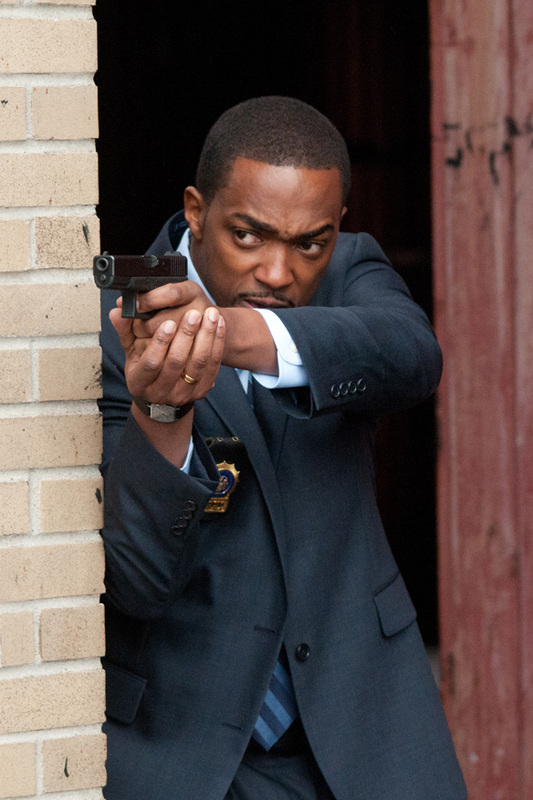 Anthony Mackie appears as Cassidy’s ex-colleague and continues to fail to build on the acting monumentum he out forward with The Hurt Locker. It is a generic and absolutely unmemorable role, not deserving of such a promsing actor. However, credit is where credit is due. Despite workman-like direction, an average technical execution and a somewhat ridiculous set-up, the movie never fails to keep the audience involved. It moves at a very swift pace, alternating between the heist and Worthington’s scenes on the ledge. There’s a constant been-there seen-that feel during the film, but that still doesn’t detract much from the enjoyment. What does hurt it, though, is that in the final 20 minutes the film’s logic finally steps out on the ledge itself and, without any hesitation, jumps to the ground. Some character’s actions become simply inexplicable, whereas certain resolutions and twists seem way too convenient. It’s as if the screenwriter who hasn’t exactly served up terribly original concepts before, just ran out of ideas and wrapped up things quickly in the most simplistic way. Even though there are still thrills here and there during the finale, one can’t help but chuckle at the ridiculousness of the whole thing. The film is not a bad way to waste 100 minutes, but the main thing it achieves is the longing to watch the superior films it has ripped off.